I’m a big fan of John Mihelic’s productions from his Tupelo, MS base as you can tell from the number of pages on this site that feature them. Artists Lloyd Hendricks, Sonny Holley and Larry Hobson have already been featured and I will cover more in due course. But if the pick of the female artists he recorded was Joyce Jones, Ann Bogus can’t be far behind. 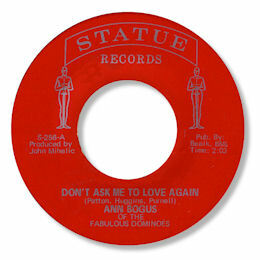 Don’t Ask Me To Love Again is a fine piece of southern soul from the classic period with a nice relaxed feel, good horns and a tuneful vocal. The funky “You Got It Wrong” is taken at a more forceful pace. The drummer on the session – and many other Mihelic dates – was Joe Wilson – who went on to set up his own studio in Muscle Shoals. He did big business in commercial work for the advertising industry but also recorded a considerable amount of R & B for artists like John Byrd for example. 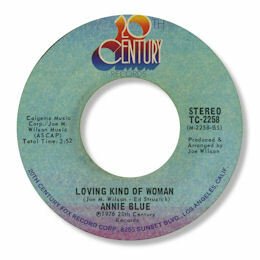 The results were often leased out to 20th Century with whom Joe had a contract as "Developmental Producer" for their acts (Barry White spent time in his studio for example) and another artist who had a couple of Wilson produced 45s out on the label was Annie Blue, who turns out to be Ann Bogus in disguise. Her first 20th Century release “Bottle Of Wine” is almost pure country rather than country soul, but “Do You Wanna Do A Thing” is fine strutting southern funk, which, for some reason has eluded the dance crowd. The flip however is a peach of a country soul track – totally unknown. Loving Kind Of Woman has the feel of Bettye’s Swann’s Capitol recordings about it – and that is pretty high praise. A delicious melody, some fine breathy singing and a cracking band. What more could you want? UPDATE ~ I'm very pleased to say that Joseph Wilson himself has been in touch with the following excellent info on his Muscle Shoals studio - "It was the only facility ever there with an acoustically tuned control room and the only facility ever equipped to do quadraphonic recording and mixing. It was actually ahead of state-of-the-art at the time; it was cutting edge. My commercial work was primarily for McDonald's, Budweiser, Coca-Cola, General Motors and other multinational corporations. In fact, in a recent listing of the top 10 advertising campaigns in America... I did the music for three of them. I commonly used my recording artists as vocal talent on those works as a way to keep them fed until I could land them a record deal. I'm obviously proud of that part of my career." He mentions the band on Ann's 20th Century recordings - "That was my studio house band or staff as you might call it with me on drums. We had records out on both ABC/Dunhill and ATCO in 1975/76. The band had a name: "Faux Noir" or "False Black" as one might say. The name was rather tongue in cheek and got lots of attention. A lot of uneducated people at the time thought the name at the time was "phone wire". We always got a big kick out of it." Concerning his role with 20th Century Joseph comments - "My job there was to take their newly signed artists, put them in the studio and try to develop a signature sound, to identify material for their upcoming recordings... some of which I made. In that regard, two of the tracks on the first Barry White album were recorded at my place. You can also find me noted as having worked in that manner with other artists."